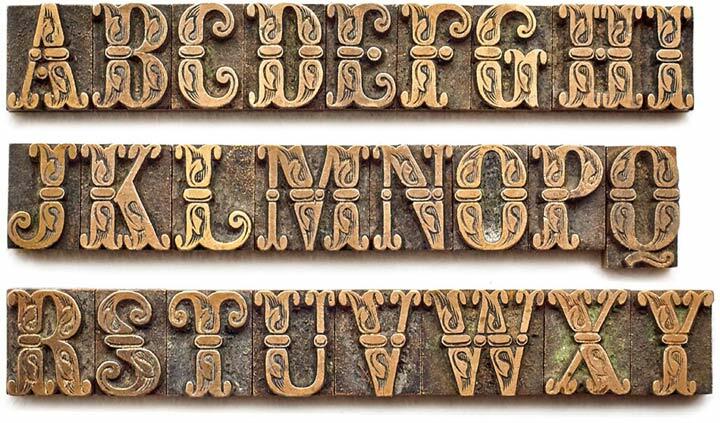 The Rocaie fonts are based on antique Rococo letters from an gilding workshop. I was very lucky to acquire this set of metal letters in early 2018. Each of the letters has ornaments engraved by hand into its cast brass shapes. The prospect of creating a multi-style digital version of these unique letterforms was a thrill and a challenge to me. When drawing the digital outlines, I tried to preserve the handmade look of the original leaf engravings. Each of the letters uses a slightly different ornament pattern: no pattern is repeated identically. I expanded the very limited character set of the original, adding all the missing characters that today's commercial fonts are expected to contain. I tweaked the proportions a bit to make the typeface more harmonious without disturbing the original spirit. I made additional font styles to easily add colour layers, outlines, and 3D shadows to the typeface. These styles are also useful for special finishing techniques such as blind imaging, embossing, stamping, partial UV coating and laser cutting. It's up to you to decide how to "build" your colour font! You can combine the predefined font styles Regular, Pearl, Solid, Outline, and Magnum with each other, or with the Fill font styles. But you don't need to use all font styles to compose something nice! The basic font Rocaie Regular with no added effects works best in negative layout settings, like golden letters on dark leather book jackets — the alphabet's original purpose. But by adding an outline font style (Rocaie Cloud) or 3D shadow (Rocaie Shadow) you are able to achieve the negative lighting effect on white backgrounds too, or just use the ready-made styles Rocaie Outline and Rocaie Magnum. Have as much fun as I did with this Baroque beauty and enjoy the vintage.